Thigh or breast? Growing up, the answer wasn’t even a question. I picked off chicken skin all crackly and dripping with flavor and exiled it to the outer rim of the plate, eager to eat the chicken breast below. I’m not sure when I learned that we ate chicken thighs because they kept the grocery receipt in check. My childhood is checkered with devout refusals at the dining table. The Thanksgiving table did a lot to win me over to the dark side as it offered small strips of white meat and dark meat in close proximity. As my cousin noshed on a plate of Parker House rolls, I discovered the juiciness and flavor of thigh meat I’d eluded for so long. In cooking classes, my appreciation deepened upon learning how this cut of meat only gets better with time when cooked low and slow. I finally made the 360. The meat counter at the food shopper’s utopia, also known as Berkeley Bowl, inspired me as I walked past a dizzying array of meat. 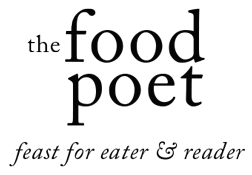 I sometimes do this, amble about and take in the ingredients letting them inspire what might be possible. And so, on this day, I happened upon ground chicken, which in and of itself wasn’t that exciting. What enticed me to order two pounds on the spot were the two little words finishing up the description: thigh meat. Sigh. Right then and there, I worked my way back to the produce section even though my cart already had its fill of fruits and leafy vegetables. My cart traipsed around the cavernous store until I ended up in my kitchen to chase down the flavors teasing me in my head. 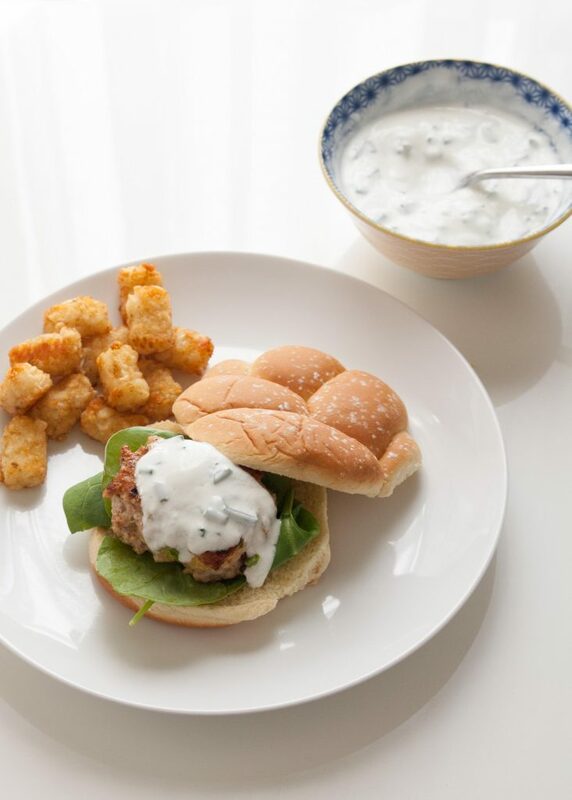 We didn’t wait a whole week to make the Jalapeno Cheddar Chicken Burgers again. A few things to know about the burgers: thigh meat does yield a juicier burger, but a quick mix of mayonnaise (is there any other brand but Hellman’s—hello, nostalgia of childhood) also ups the ante. When mixing the ground chicken, you want deft, confident movements so the cheese and jalapenos get incorporated in quickly without overworking the meat. Here’s the other bit, the meat should be cold. I tried this several different ways and found that the best method was to form the meat into balls, cover and chill them overnight letting the flavors of the other ingredients meld with the meat, or you can chill them for an hour. My burgers were made better with these burger master tips from J Kenji Lopez-Alt. When it’s time to make the burgers, using your knuckles lightly dimple the top of the burger balls so that while they are cooking they keep the burger shape, but try not to press down on the burgers as you want to lock in all the juices. Though jalapeno leads the name of this burger, they’re not achingly hot, and you have the cool yogurt sauce to temper the heat. For the yogurt in the sauce, I like using Straus organic whole milk yogurt because it’s a little loose without being too runny, but you could certainly use a thicker, strained Greek yogurt too. When working with jalapeños, the oils of the membrane can get on your hands leading to a burning situation if you accidentally touch your face. If you wear gloves or immediately wash your hands well after handling the jalapeño that averts any problems. You can seed the jalapeño if you’re worried about making the burger too spicy, though I don’t. Mix the meat with jalapeño, cheese, and mayonnaise. Place a piece of plastic wrap on a food scale. Portion the meat into quarter pound mounds, until you have eight mounds of meat. Form the mounds into balls. Place them on a plate. Cover and chill for an hour, until the meat is cold or overnight. Mix together the yogurt and chives. Chill until serving the burgers. 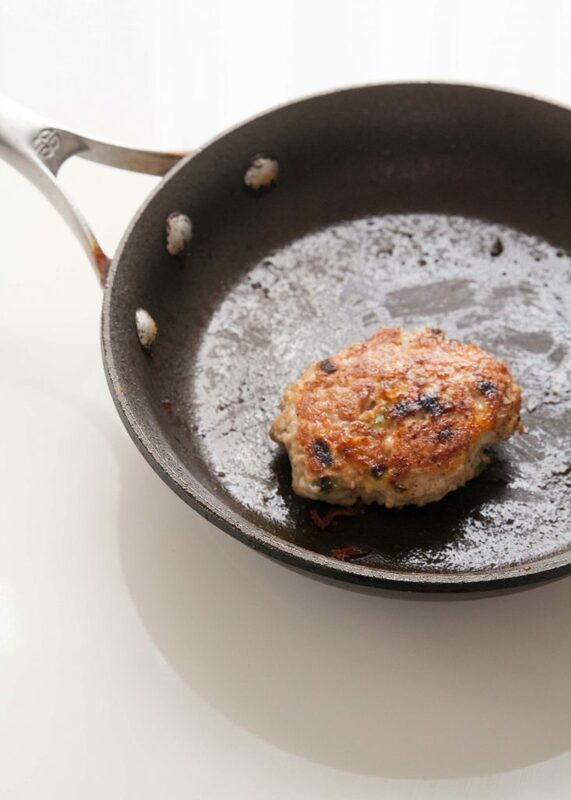 When ready to cook, place a nonstick skillet over medium high heat. Sprinkle a touch of water into the pan–if it sizzles, the pan is hot enough. Pinch a bit of salt and pepper to sprinkle over the top of the burger. Add a burger to the pan, dimpling the middle of the meat down about an inch. Cook each side for 6 minutes or until the meat is cooked through and registers 165F internal temperature. When you flip the meat make sure to sprinkle a bit of the pepper and salt on the other side of the meat. 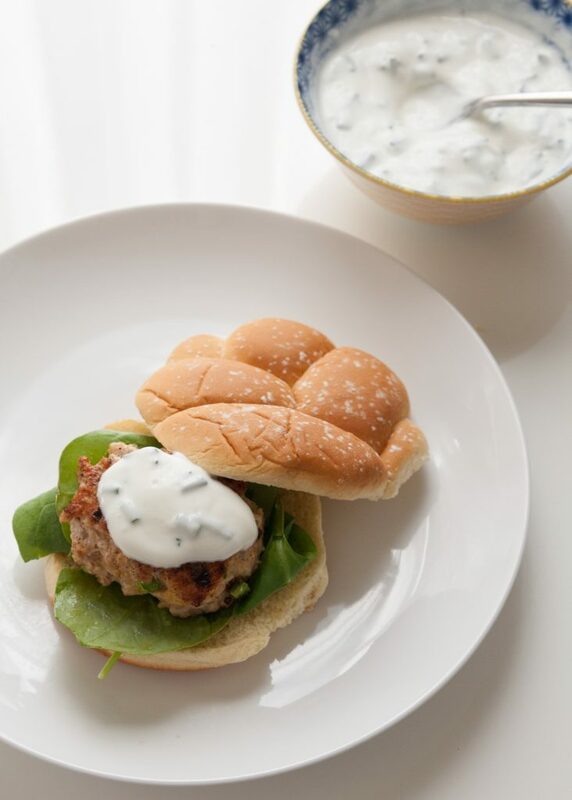 Serve on a bun with lettuce and a dollop of the chive yogurt. THESE SOUND DELICIOUS…and wouldn’t you know I have two jalepenos laying about just begging to be incorporated into something delicious. J would totally love these, too. Maybe this weekend I will try. I have to get chicken.